The story of how a giant octopus named Inky escaped its aquarium in New Zealand has become legend at this point as the escape heard round the world. Sometime during the night the octopus crawled out of its tank at the National Aquarium of New Zealand and slithered across the floor to a 6-inch drain pipe that leads to the sea. The octopus, with a football-sized head, must have traveled the 50 meters of the pipe to the sea. Staff members saw the slime marks on the ground and could deduce how the escape artist managed to pull it off. Rob Yarrell, national manager of the aquarium, told The Guardian, he didn’t think the octopus was escaping out of any discontent. There is plenty of evidence to suggest that octopus are just naturally curious creatures, and they enjoy taking things apart. 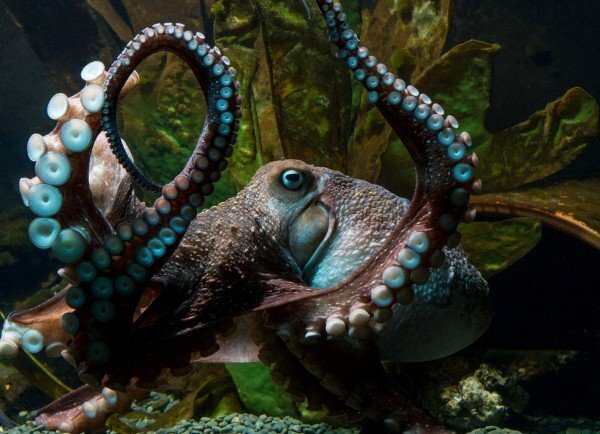 In 2009, an octopus at the Santa Monica Aquarium dismantled a valve that flooded the facility. Jennifer Mather, a comparative psychologist at the University of Lethbridge in Alberta, Canada spoke with Scientific American about the subject. She said they are very smart and can problem solve. “They are very strong, and it is practically impossible to keep an octopus in a tank unless you are very lucky. . . . Octopuses simply take things apart,” she said. Inky was brought to the aquarium several years ago after being caught in fishing gear. According to Yarrell, the creature had personality.